Ok, I've been blogging a decent amount about the 1/1 Gundam in Odaiba but there is much more to add about this thing. As of a few days back, Anime News Network announced that wedding ceremonies will now be done in front of the statue! This isn't just something a bunch of otaku decided to scheme up, it's actually being done by a professional wedding groups (known as Take and Give Needs (T&G)) and even by the famed wedding planner, Akemi Ariga. Thing is, applications to have our wedding done will be closing by the 26th in order to get the ceremonies all done before the statue closes on Aug. 30th. 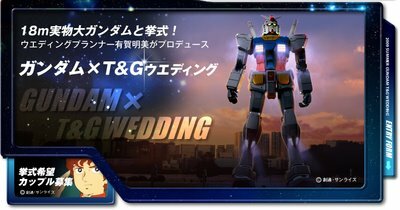 So with that said...who'd want to be married in front of the 59 foot RX-78? Actually, the big question is, who has a significant other who'd agree to this? Some of you might know that I'm engaged to marry my long time girl friend and AMV master, Danielle. 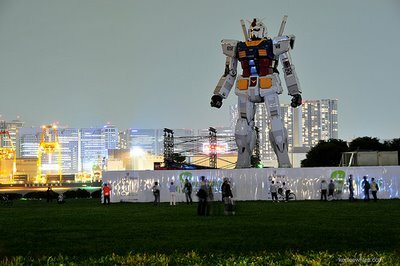 I'm lucky that she' my part asian fiancee who's also a rabid otaku, thus she'd most likely not mind having the wedding there in front of the Gundam. We won't have the chance to sign up for this but our wedding plans for next year might still have Odaiba in the picture. Thing is, Danielle's grandmother used to work for the heads of such companies like Panasonic and her connections might allow us to stay at one of the 5 star hotels on Odaiba (somewhere near Rainbow Bridge). So, for our honeymoon, we might have the luxury to look out the window and see the Gundam..just wish the yen vs. the dollar ratio would change -_- It's getting very expensive to get items from our favorite land.